Sally Magnusson received an honorary doctorate in recognition of her outstanding contribution to Scottish life and her support of the University’s Dementia Services Development Centre. Photo: Elaine Livingstone. 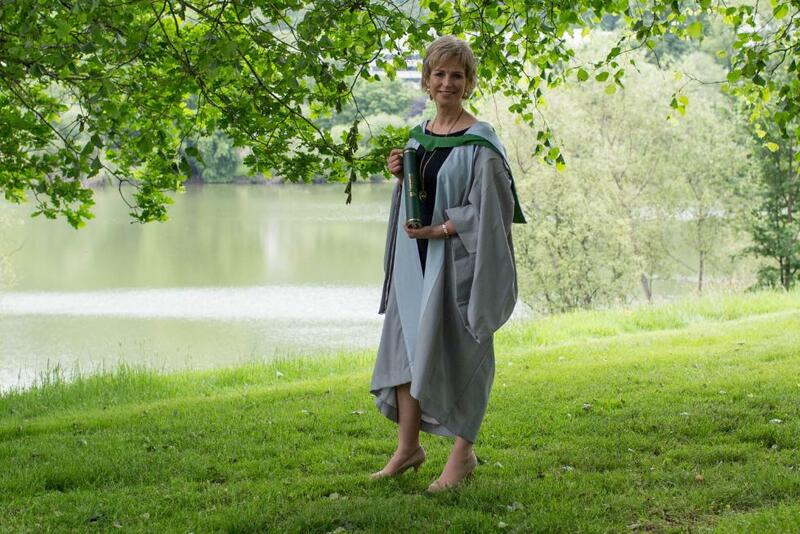 Almost 400 graduates celebrated with honorary graduates Sally Magnusson and Kevin Clarke at the University of Stirling’s final summer 2015 graduation ceremony today. The long-standing Reporting Scotland presenter received an honorary doctorate for her outstanding contribution to Scottish life and her support of the University’s Dementia Services Development Centre. Sally helped to launch the Centre’s virtual care home in 2012 and returned last year to launch her book Where Memories Go, which chronicles her late mother’s dementia. After thanking the University on behalf of the graduates, Sally spoke movingly about her family’s experience of living through the ‘dementia story’ and the particular importance of music in enabling her family to help her mother in her final years. Also honoured during Thursday’s ceremony was former University of Stirling Secretary Kevin Clarke. A Stirling Philosophy graduate, Kevin served as University Secretary for more than 17 years and was honoured for his outstanding contribution and service to the University of Stirling and to the Scottish and United Kingdom Higher Education sector. Wednesday’s ceremonies celebrated the achievements of almost 700 graduates from the Schools of Education, Management, Arts and Humanities, and Sport and also bestowed honorary degrees on artist and playwright John Byrne and Sir John Elvidge, former Permanent Secretary to the Scottish Government. This summer, more than 80 percent of Stirling honours degree graduates achieved either a first or 2:1 and 94 percent of Stirling graduates are in employment or further study six months after graduation. Photos, social media and graduate stories from the summer graduation ceremonies are available at our dedicated Graduation Live website.